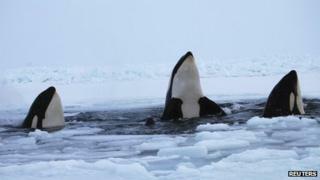 A dozen killer whales trapped under sea ice with only a single breathing hole have reached safety in Canada's Hudson Bay, local villagers have reported. The winds shifted overnight, pushing floating ice away from the coast and opening the water, Inukjuak village leader Tommy Palliser said. The whales had been jockeying for space to breathe through a gap in the ice. They were spotted by a hunter on Tuesday, the day after residents say the bay froze. Since then, two hunters reported the water had opened around the area where the whales were seen surfacing for air, Mr Palliser said. "They confirmed that the whales were no longer there and there was a lot of open water," the Inukjuak leader said. "That's good news for the whales," he added. But some experts warn that although the whales may have moved away from the waters around Inukjuak, they could still be in danger. Marine researcher Lyne Morissette said the whales would still have to travel more than 100km (62 miles) to reach the open waters of the northern Atlantic Ocean. She added that it would be a significant loss for the local whale population if the pod did not make it, CBC News reported. Many villagers made the one-hour snowmobile ride on Tuesday to see the whales. The Inukjuak public safety officer told CTV on Wednesday the whales should not even be in the area in January. On Wednesday, the village asked the Canadian government to send icebreaker ships to help free the whales. But Inukjuak Mayor Peter Inukpuk said the ships were too far away to help. Villagers had said they would launch their own rescue operation with chainsaw and drills.